Over the past few months we've been really trying to cut out the process foods and eat healthier options as much as possible. Now that we're into late Spring and Summer is just around the corner, I'm trying out a slew of new recipes that utilize fresh products and alternative ingredients. Today's guest post recipe is courtesy of Terra's Kitchen. It will make 4 servings. Directions: Heat wok or large skillet to high. Add 1 tablespoon canola oil. Sauté the garlic and ginger together. Add the sugar snap peas, spinach, bok choy, broccoli, fish sauce, and half of the sesame oil. 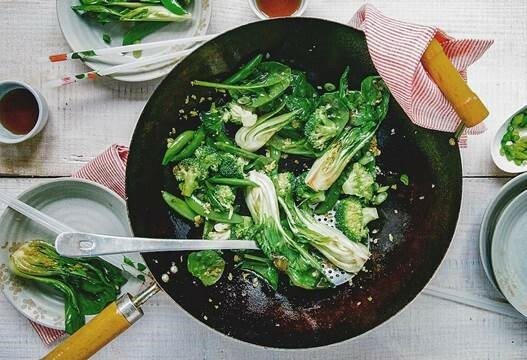 Stir-fry quickly until the vegetables start to brown slightly and become tender. Remove from heat. Stir in remaining sesame oil, scallion, and 1/8 teaspoon pepper. Pro Tip: Remember HPCO! Hot. Pan. Cold. Oil. When stir-frying always remember to heat your wok BEFORE you add the oil. HPCO goes for sautéing too.